Every Spring I start writing this post, and every Spring I don't post it because I think it's too snarky and self-rightous. However, I've finally had enough, so I'm finishing it. Spring is here, and while I'm happy for the warmer weather, there is one thing that really irks me about this time of year. It's the large amount of people who suddenly remember that we have parks in Nashville and all decide to use them at one time. As someone who uses the parks throughout the year, this is more than just the annoyance of not being able to find any parking (for the record, I do think that year-round park users should get some kind of reserved parking since we're there all of the time. Just kidding...kind of.) No, the real annoyance is not only are the parks suddenly crazy crowded, but that many of the people completely lack any greenway etiquette. In a large park, this might not be a big deal or even noticeable, however, my usual park is small and in a densely populated area. You'll pass the same person on the greenway several times if you're running laps. So, in an effort to make everyone's visit to the park a little bit more pleasant (and safe), I'm going to take this opportunity to lay out a few guidelines. Rule #1: On greenways - stay to your right, pass on your left. This is so easy, yet so many people don't do it. Unlike running / walking on a road, when you go against traffic, walking on the greenway is like driving a car - you stay to the right, and pass on the left. This does not mean wandering in the middle of the greenway so I have to wonder what direction you're going to go when I pass you - it means staying to the right. Rule #2: If you have two or more people in your group - you still stay to the right. Please do not take up the entire greenway and expect people who pass you to leave the pavement in order to accommodate your large group. Yes, this means that you might have walk closer to each other or even walk single file for a few seconds while people are passing. Rule #3: Give a head's up. When passing a walker / runner on a bike or rollerblades, verbally acknowledge that you're going to do so. You don't have to yell - just a polite "On your left" is fine. Y'all, seriously. Pay attention to what's going on around you. Yes, I'm talking to YOU, Mr. "I'm looking at my phone and have my headphones on and I'm aimlessly wandering on both sides of the greenway and don't have any idea where I'm going." This is not only dangerous, but also kind of sad. Why did you even bother going to the park if you're not going to take your eyes off of your phone? And for the record, I learned from experience on this one. One time, I had to turn around on a run and ran smack into a cyclist who was passing. This was back when I ran with music and I just didn't hear him coming. Fortunately, we were both OK, but lesson learned. Rule #5: When stopped, move off the greenway. This is related to Rule #4. If you need to stop on the greenway for whatever reason (shoe becomes untied, you run into friends, etc.) and there are people running / riding around you - move off the greenway. This also applies to your stuff. Please don't leave your bike / chair / stroller blocking the greenway while you go look at a squirrel. Rule #5: Cyclists - slow down! Greenways have a speed limit of 15 mph for a reason. Rule #6: Mind your kids. This is the rule that is probably going to get me into the most trouble, especially since I don't have kids, but it's also the most important. Look - I understand that I'm in a PARK. By design, it's a place for recreation and fun. And kids can run like wild when on the grassy areas! But crowded greenways can be dangerous. There are walkers, bikers, skateboarders, rollerbladers, people with dogs or strollers, etc. out on the greenways. Maybe letting your barely-walking toddler wander freely down the crowded greenway alone isn't the best idea if you don't want your child to be hit. I know I've had a couple of close calls with kids and I'm paying attention to what's going on. You get Mr. Eyes-On-His-Phone wandering down the greenway at the same time as your child, and your kid is going to get run over and hurt. Yes, the adult should have been paying attention, but your child is still injured. Minding your kids applies to off the greenway, as well. I can't tell you how many times I've run by a soccer field to see all of the parents lined up watching the game, while a younger child is meandering unsupervised a field away. For the record - I'm not referring to kids that are 5-10 years old. I'm talking still-in-diapers toddlers. I think people get in this mindset that "I'm in a park, nothing bad can happen." Or maybe they assume another adult is watching their child. Well, here's an example of why assuming doesn't work. Last year, I was at Concord Park in Brentwood. I got out of the car and saw a cookout going on at the nearby picnic shelter with about 20-25 people, with about half being adults. As I'm walking over to the trailhead where I'm going to start my run, I noticed several of the women from the cookout standing there and they are visibly agitated. A little girl (four years old) was missing. A few other runners happened to be around, so we got a description of the girl were about to take off looking for her when we were notified that she (thankfully) had been found safe at the nearby YMCA. Y'all - this child had crossed a over a bridge, walked the distance of a football field and crawled through a hole in a fence into the pool area of the Y, where she was found by a Y employee who happened to be walking through. That child had to been missing at least 10 minutes before anyone noticed she was gone. So that's it. Hopefully, this didn't come off as too preachy. I know some of you might be expecting something about dogs, but I honestly haven't had any issues with dogs on the greenways. Trails, maybe, but not on the greenways. If you have anything you wish to add, please do! 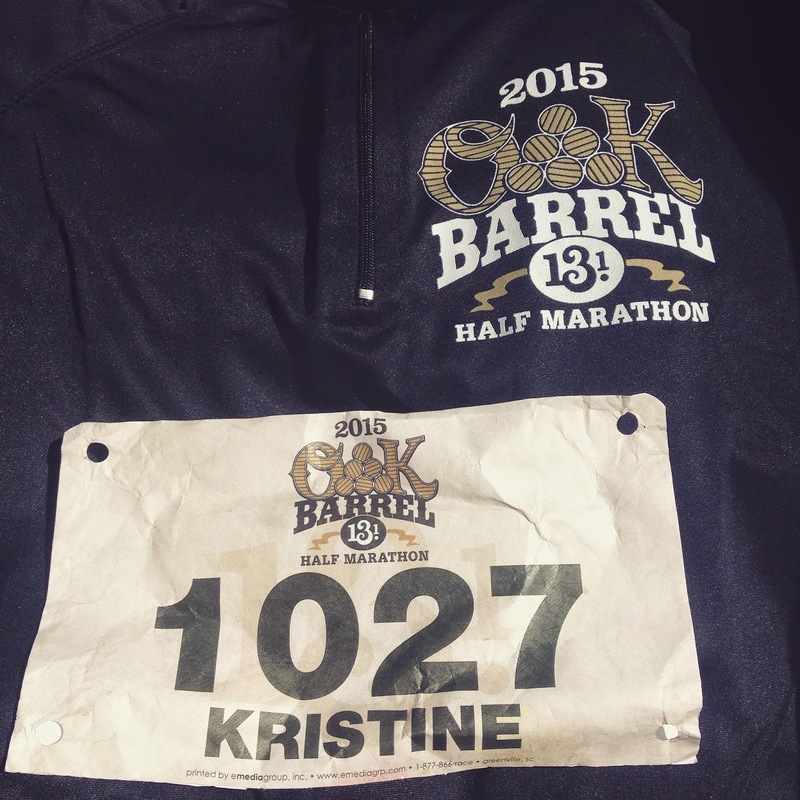 About two weeks ago, I ran the Oak Barrel Half Marathon. Unfortunately, so much has happened between then and now that it seems like six months ago. But I'll do my best to recap. I wasn't originally planning on running this race. Don't get me wrong - I did it in 2013 and it's a GREAT race. I highly recommend it. But since I'm trying to knock off my states, repeating races isn't something I generally do. However, Dudley missed this race for injury in 2013 and really wanted to do it, so we signed up. I was a little concerned about how this race was going to turn out, considering I had a complete burn-out earlier in the week. Could I really go from not being able to make a three mile run to completing a half marathon in the same week? I was about to find out. 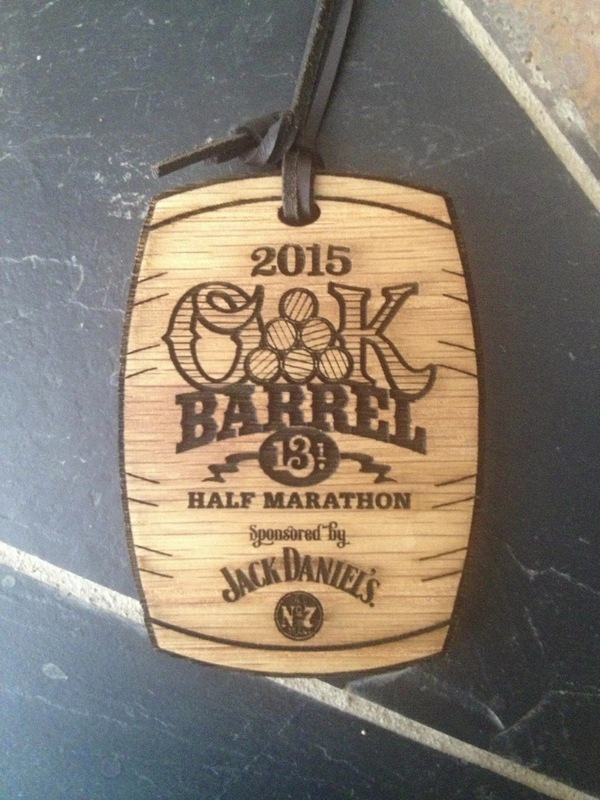 This race in held in Lynchburg, the home of Jack Daniels (the main sponsor of the race), and is about 1.5 hours away. This meant getting up at 4:30. Yikes. Fortunately, there was a lunar eclipse going on during our drive down there, which I definitely wouldn't have seen otherwise. It was a nice little bonus. We received an e-mail from the race director stating that parking was limited and get to the race early. Being that it's a small race that caps at around 1,400 people, we figured an hour early would be fine. Turns out - not so much. Parking was a nightmare. We kept being directed further and further away from the race site, until we finally ended up at a lot about a 15 minute walk from the starting line. Again, this is for a race of 1,400 people! It's not like there were 30,000 people there. Anyway, by the time we walked to packet pickup, then back to the car to drop off our shirts and then BACK to the start, the National Anthem was starting. I felt really rushed and it kind of threw me off my game. But the worst part of it was that while we were walking back to the starting line, we saw several people parking right next to the start in an open lot. I don't know if the race directors saved parking for people who arrived late or what, but we were hot about that. It's not cool to force people who get there early to park forever away and let others who roll up last minute to park next to the start / finish line. Anyway, as I said, we were rushed and it kind of threw me off. I also got separated from Dudley at this point and never saw him again before the race. I'm not sure how that happened in a race so small, but it did. My coach wanted me to break 2:00 in this race, which I literally laughed at because Oak Barrel is a really tough course. There is a crazy hill around mile 4-5 that is so bad that it has a name- Whiskey Hill. But I thought I'd at least make an attempt at sub-2:00, so I ran up to around the 9:00/mile corral right as the starting horn went off. A great thing about a race this small is that you will run into people you know. Right off, I saw Marc, who is one of my FTP teammates. He's much faster than me, but we chatted for the first two or so miles before he took off. 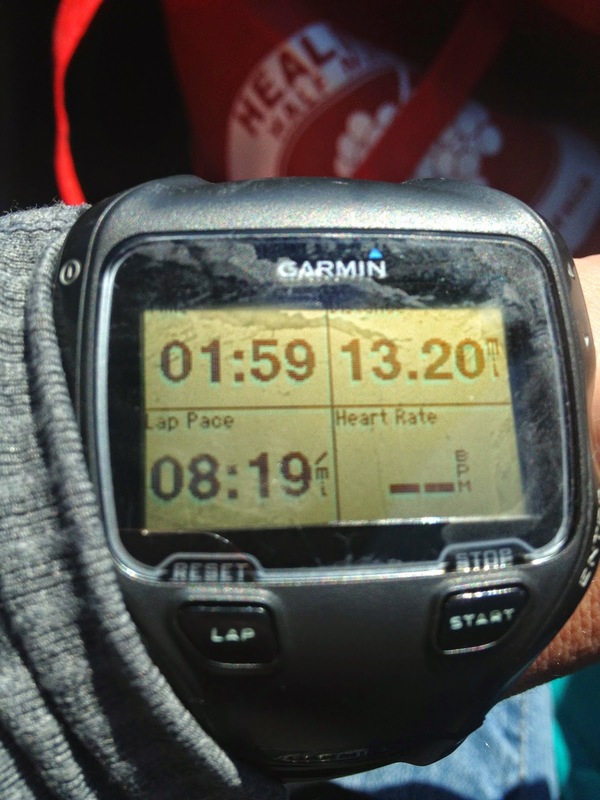 We were doing sub-9:00 miles, which is pretty fast for me, but they didn't seem too hard and I wanted to bank some time because I knew I'd be walking up Whiskey Hill. As a warning you're about to hit Whiskey Hill, you start hearing the theme to "Deliverance" coming from the woods. You know - "Dueling Banjos?" I knew they did this since I've run the race before, but it still made me laugh. Especially hearing all of the first timers say "Do you hear banjos?" Once I hit the Hill, I just tried to keep a steady pace. It's a LONG hill with the really steep incline towards the end. Unfortunately, I got overheated since I was still wearing my long-sleeved shirt (one of the effects of being rushed in the morning). I slowed to a walk to take it off, and while I was tying it around my waist, along came Marc (who I had passed at a water stop) and was all "Ready to run up this thing?" Of course, I wasn't, but he's like the Energizer Bunny and his attitude is contagious, so I started running again. I got almost up to the top when I had to stop and let Marc go on solo. I was dying. It was so steep that my run was almost like walking up the hill anyway. Good news is that once you get to the top of the Hill, you know you've put the worst behind you. Yes, there is another beast of a hill less than a mile later, but it's only a third of the length of Whiskey Hill. After that - you've got nothing but rollers and downhill for the rest of the race. I didn't really pay any attention to my time until I hit mile nine or so. I mean, I walked up part of Whiskey Hill - I was sure my sub-2:00 goal was out of reach. Turns out, it wasn't. I started doing some math and if I pushed it for the rest of the race, I not only could go sub-2:00, but possibly PR (my PR is 1:58:56)! At Oak Barrel! No one PR's at Oak Barrel! So now it was ON. It's a difficult thing when you know you're close to a goal, but still have several miles to go. You want to push it, but you also don't want to die. It's a fine line. The good news was I was on the easy part of the course, and I let gravity do it's job on every downhill. I'm not the best descender, but I did my best to lean into the hill and just let my legs go. On the flats, I focused on form. Not speed, but form. This really helped. So close... (and yes, my watch is filthy). I missed my PR by 12 seconds. Whomp Whomp. But you know what? I went sub-2:00 at Oak Barrel. I will take that any day. 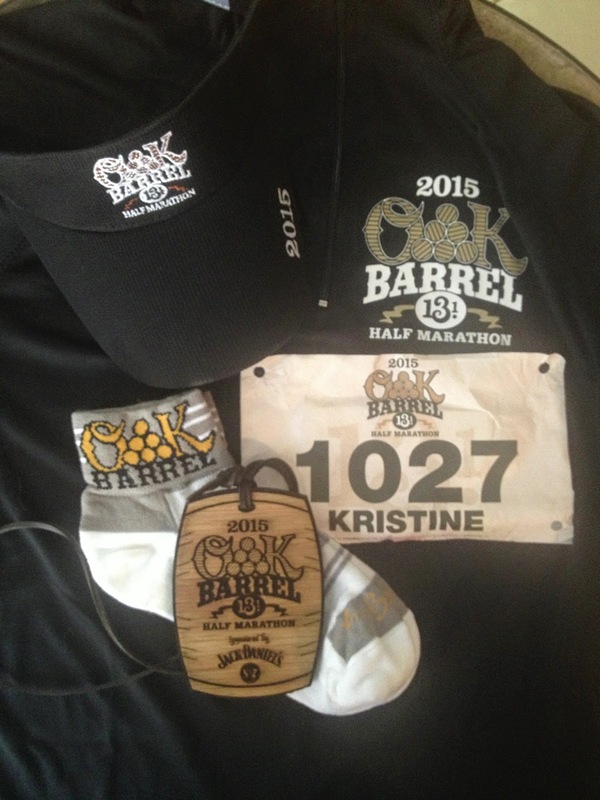 One of the great things about Oak Barrel is all of the race swag you get. This year, the race shirt was a long sleeved tech shirt, and you also get a pair of socks and a cap/visor when you finish. Oak Barrel also has one of the best medals ever. Medal close up. Made from actual Jack Daniel's Oak Barrels! After picking up my swag, I hung out and waited for my friends and Dudley to finish. As I mentioned, I lost Dudley before the race and I had no idea where he was. As I saw more and more friends at the finish, I got a little concerned because NO ONE had seen him. Not at the start, not on the course - no where! I did know he was planning on taking his time with this race, as he wasn't fully trained and didn't want to get hurt by pushing it. But after almost an hour, I figured we missed each other and he went to the car to find me. Nope - he wasn't there either. Now I was REALLY worried because I figured he had to be hurt or lost, and was probably really mad. I turned around to make the hike back to the race start (remember- we parked forever away) when I finally saw him. I was so relieved! Turns out - we DID miss each other. Somehow, he walked right by me when I was talking to my friends. I think I saw 20 of my friends at the finish and totally missed my husband. Funny, huh? With the exception of the parking issue, this was an exceptional race. I've been lucky to have great weather the two times I've done it, so that helps. You have to sign up in October and it sells out every year, so if you want to do it, plan ahead. And be sure to stick around after the race, as they have great food and a fun band at the post-race party. Not your ordinary post-race food either. It's a whole Southern thing with Brunswick Stew and home-made hoecakes. It's a lot of fun and absolutely worth the trip to Lynchburg. This morning, I was supposed to run five miles. Nothing crazy. Just five miles, mostly easy with a few minutes of tempo. No big deal, right? So I got up, got dressed and started running...and it's terrible. Just awful. It was like was trying to run through a bed of molasses. What was weird about it was that there wasn't really a reason for it. I'm not hurt. I'm not overly tired. I was hitting my pace fine. But for whatever reason, I just couldn't get into my run this morning. So I didn't. I hit a mile and a half and thought, "I don't want to do this anymore" and walked home. Yes, that is correct. I quit mid-run and walked home. I figured I'd give it a go again after work when I was a little more awake. I repeated the same routine I did in the morning. Got out of work, changed clothes and started running. The weather was perfect - a beautiful Spring day with bright blue skies. I even decided on a route that was full of blooming Cherry Blossom trees, thinking that a scenic run would get me more excited about running. Nope. Didn't even make it a mile this time before turning around. I finally admitted to myself that I'm burnt out. The motivation just wasn't there. At least today, it wasn't. I'm not sure about tomorrow. I'm supposed to ride in the morning. I'll guess I'll find out then. Until then, I'm taking the night off and watching junk TV. If anyone has a little extra motivation I can buy from them, please let me know. I'll pay good money for it.